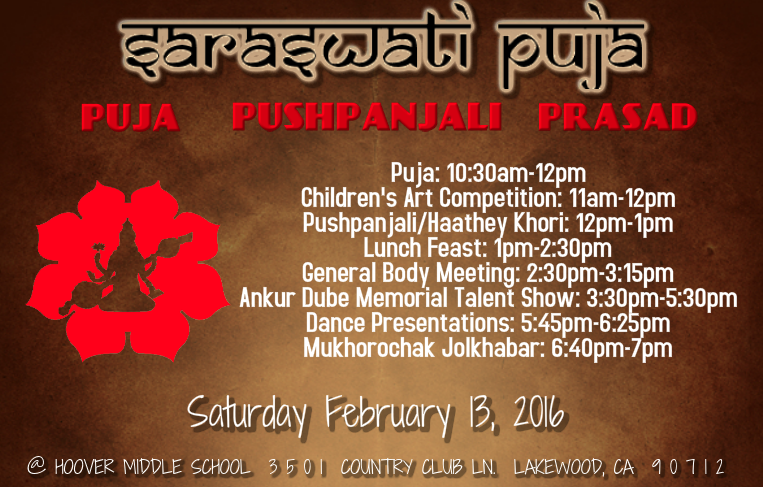 Saraswati Puja is just around the corner! We will be celebrating on Saturday February 13th, 2016 @ Hoover Middle School (3501 Country Club Ln. Lakewood, CA 90712). We will begin the morning with the auspicious puja and end the evening with a mukhorochak jolkhabar. Please see the tentative schedule below. As you all know, our superb Food Committee does a tremendous job when it comes to our events. We are truly grateful for their dedication. Please RSVP no later than February 6th so that they have an estimate of people attending. We do not want there to be a shortage or wastage of food.